Following his execution, a serial killer comes to back to life to take vengeance on the young boy who helped the police capture him. When talking about Wes Craven, movies that immediately comes to mind are always A Nightmare on Elm Street, Scream, Hills Have Eyes or even The Last House on the Left. 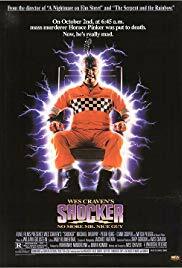 Indeed, for some unknown reason, Shocker tends to be the forgotten offspring of Wes Craven, but one that truly deserves to be better known. Shocker is very interesting in the way it is built: it really feels like an accumulation of multiple movies. The first half-hour is a classic slasher, then it somehow becomes paranormal, then throw in some possession, later the guy becomes a ghost, etc. All this makes Shocker a weird mess, but something very unique. The movie is really contrasted: it has this cheesy 90s feeling, but coupled with a very dark atmosphere. 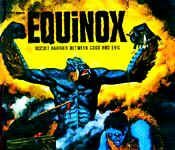 At times, the movie feels like a black comedy, at other times, it becomes quite scary, featuring lots of gruesome death and characters dropping like flies. In any case, the result is very unsettling. Maybe the only real problem with Shocker is the special effects which really are laughable nowadays. This really destroys the second half of the movie’s credibility and stops it from being scary altogether…making Shocker more of a fun entertainment rather than the great psychological horror that it could have been.